I don't think I'll ever be one of those women who can just wear all white; I always have to have a few pops of color somewhere in my outfit. 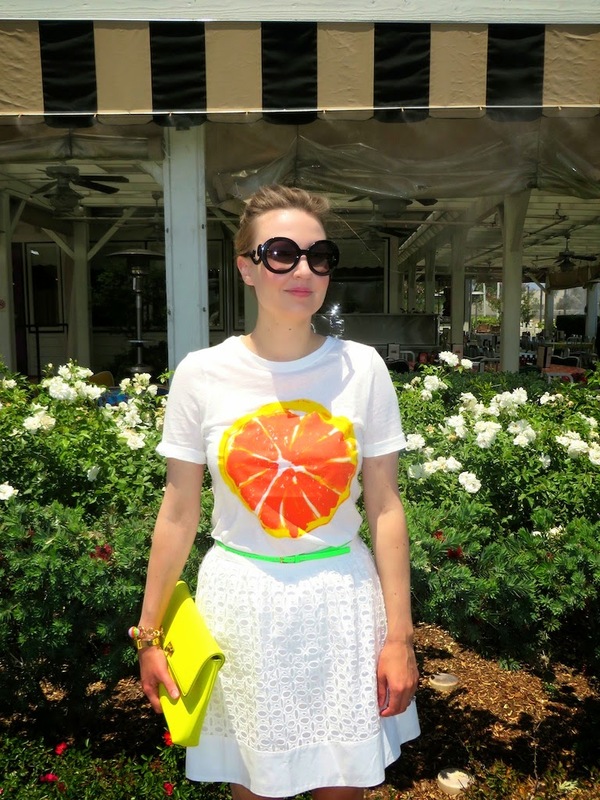 Today I wore mostly white save for the gigantic slice of citrus on my shirt, my neon green belt and yellow clutch. 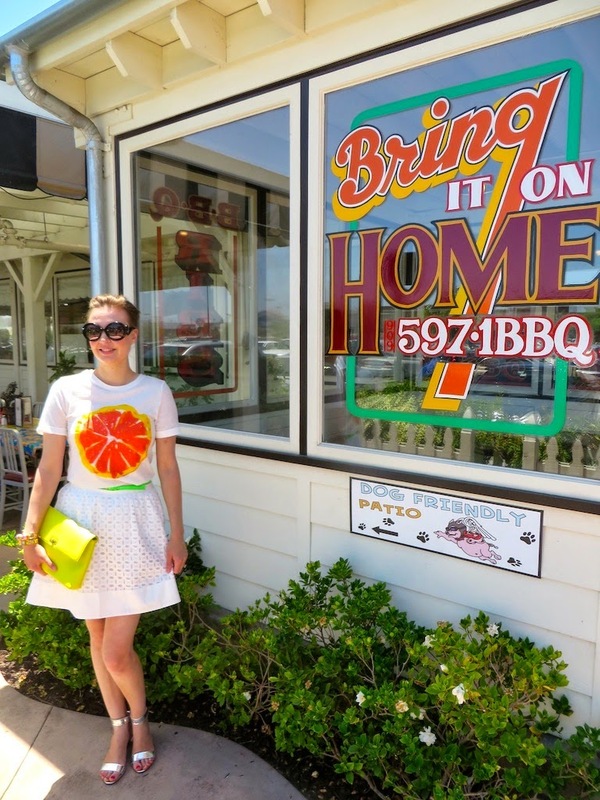 Well, white (or mostly white) probably wasn't the best choice to wear to a BBQ joint for ribs. BBQ sauce and white don't make for a good combo as any country singer will tell you. But I was just dying to wear my new diamond cotton eyelet skirt from LOFT somewhere summery. Also, I didn't have ribs for lunch, rather I had a fried chicken sandwich and mac n' cheese which was decidedly less of a BBQ sauce blood bath in comparison to my husband's full rack of ribs. If you follow my blog you probably know by now that I like to "theme out" all of my outfits. Somehow I am always able to match what I am doing and where I am going to my wardrobe. 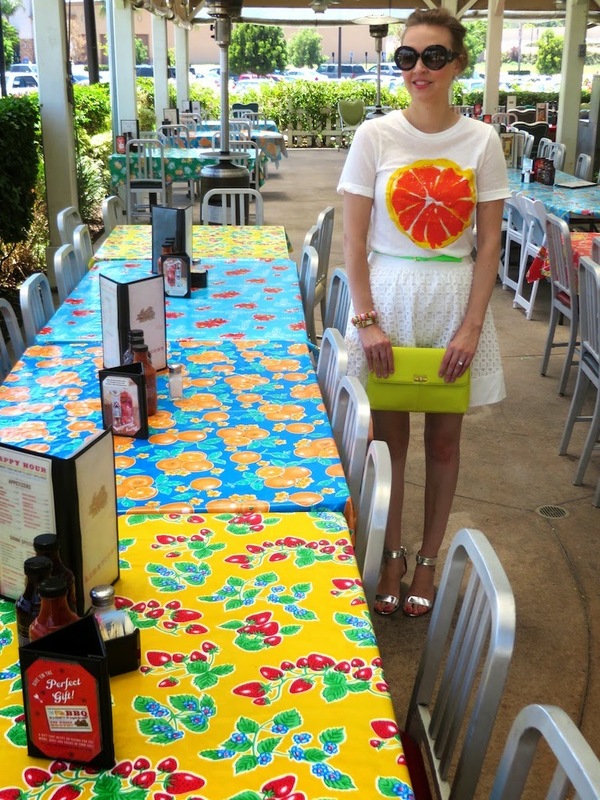 The fact that my shirt just happens to match the tablecloths at the restaurant I swear was an accident. This was my first time going to this particular restaurant and the orange themed table clothes were just a cosmic coincidence! I'd love to be able to wear all white - something so timeless and chic about it. Alas, I am also a klutz and ketchup stain magnet, so it's probably best I steer clear! I agree that wearing white is so chic and elegant. Maybe one day I will be able to pull it off! I swear if I wear white I attract stains. I love this look though! I totally agree. Wearing white is just asking for a stain. Especially when you have pets too!